The summer holidays can be a slog for us parents sometimes. If your other half has to work for most of it *waves one hand in the air whilst holding a G&T in the other* or if you just don’t have the disposable income to go on a summer break, finding things to keep the kids amused for 6 weeks, for as little money as possible, can often be tough. With this in mind, I thought I would share with you all my, ‘8 free or thrifty things to do in Surrey’ to give you some ideas and help keep you sane! 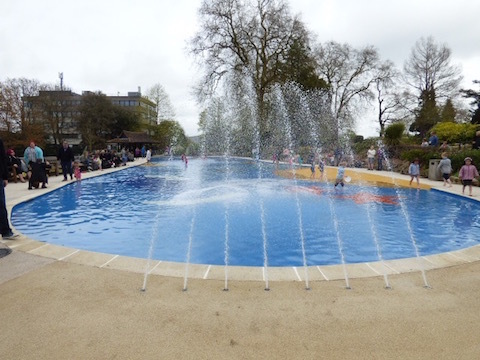 A firm favourite with kids and parents alike is Stoke Park Paddling Pool in Guildford. It is a large, free, paddling pool with a children’s park, crazy golf (£4.50 Adults and under 16’s £3), skate park, a boating pond (for model boats) and a large amount of green space to run about/picnic on. There are toilet facilities there and parking is available nearby for a small fee. If you take a picnic, a ball game and your swimming things, you’ll be certain to have a full day out and come home with happy (and hopefully worn out) children! A bit of a random one at first sight perhaps, but when I explain you’ll see why it makes for such a super day out. Abinger Hammer is a small village in the Surrey Hills. Quaint, full of character and a picture postcard English Village. The village green is home to a large green space, a children’s park (which was actually closed when we visited in August 2016 for repairs) and a river which cuts across the village green boundary. The perk of this place is that the river, in Summer with little rain, is shallow and gentle enough to paddle in. The river bed is very rocky so I would recommend wearing crocs, or some other type of water appropriate shoes, but it is perfect to cool down in on a warm day. If you take your fishing nets, some buckets and a magnifying glass, you can do some fishing or ‘pond dipping’ to see what you can catch! The village post office, opposite the green, sells drinks and snack as well as fishing nets and buckets should you require them. There is also a dainty, traditional tea room connected to it should you require the essential sustenance of tea and cake! Parking can be tricky, but I parked at the local village hall 2 minutes up the road as it wasn’t in use at the time and my vehicle seemed to be ok in there. There is also a car park for the local cricket club on the green which is available to park in. A completely free, best of british, day out, in the most picturesque of settings, should you take a picnic with you. Good for: Sunny or Rainy Days! Just make sure you wear waterproofs and wellington boots if it is raining! Box Hill is now world famous thanks to the London 2012 Olympic Road race route travelling up it, so inevitably you shall encounter some lycra clad posteriors during your vist! It has become quite the cycling Mecca. Box Hill is situated in the Surrey Hills and, once at the top, it has some of the most stunning views in the county, across the countryside, out towards Dorking. There are a number of walking trails (maps/routes are available on the National Trust Website) but I would say that Box Hill Natural Play Trail is a super day out with the kids. They can burn off some of that energy whilst enjoying and exploring the woodland! Myself and my family have done the Stepping Stones walk, which is beautiful but, with its 275 steps down, bear in mind, what goes down must come back up…it wasn’t a walk for the faint hearted, nor is it pushchair/wheelchair friendly so do bear this in mind! You can read about our walk around this route here. At the top of the hill, there is a pay and display car park (free to National trust Members), a visitors centre, cafe, shop, toilet facilities and picnic benches. It’s the perfect base for a day out exploring. Good for: Sunny or Rainy days! Just wear appropriate clothing and good walking shoes regardless of the time of year! Price: Approx. £8 parking (and spending money for cake and ice cream should you wish). We have been to Priory Park in Reigate a couple of times before and it is really brilliant. There is a huge playground, with a splash zone in the summer (not a paddling pool but a safe, non slip area where water jets and spouts allow the children to play with water), a skate park, fountained gardens, lake, an enormous amount of green space, a very modern cafe/information centre and superbly clean toilet facilities. There is a Geocaching route around the park if you’re into that (there are 7 to find) and there are also various events held there all year round. For example the summer this year (2016) they have an inflatable fun park there for the whole summer and at christmas, there will be an outdoor Ice Rink there. There is a large car park next to it and again, if you take a picnic, all you will need to pay for is parking to have a full day out. It can get busy. especially at weekends, but get there early enough and you could have it to yourself for a while! It is also the perfect place for hill rolling in summer, or sledging in winter, with its fabulous sloping hills around the edge. Definitely a place to check out. Situated on the edge of Surrey, Virginia Water lake makes up part of Windsor Great Park. It’s the perfect base for a day out exploring, wildlife spotting and, if you’re keen, cycling or scooting with the kids. At 4.5 miles, the circular route around the lake, on it’s well made, smooth tarmac paths, makes for the perfect cycle loop with kids in tow. It’s not flat, but it isn’t so challenging that it’s unmanageable. There is a visitors centre, cafe and toilets there (all of which are modern and clean) and there are various ice cream/coffee vans dotted around the lake too. There aren’t any playgrounds here but there are lots of different things to explore. There is a waterfall. some old Roman Ruins, the lake itself, a polo area, various interesting nooks and crannies off the beaten track to discover and a 100ft Totem Pole! It’s a wonderful place to go and we have managed to while away quite a few days exploring this place. There is no paddling or fishing allowed there but you can do some bird spotting and if you’re lucky, you may see a Heron or two! Get outside and explore this beautiful part of Surrey! Good for: Days out, whatever the weather. My 8 year old boys favourite place for a jaunt after becoming obsessed with H.G.Wells’ book, War of the Worlds. Visit the sandpits where the martians landed in the famous book, play on a rope swing, hunt for Bronze Age Barrows and climb some trees! This large expanse of common is protected and looked after by the Horsell Common Preservation Society. It’s a beautiful place, with multiple free car parks dotted around it, for you to be able to park up and enjoy a stroll. If you park at the new Heather Farm and Wetlands Centre, there are toilet facilities and a cafe there (which also serves wine, winner!). I love this place. Huge expanses of woodland and forest sprawl out before you, ready to be explored. Follow the signs to go on a set walk, they have a children’s route with wooden structures to explore on the way round which makes a treasure hunt type adventure out of the walk, or just follow your nose and see where you end up! 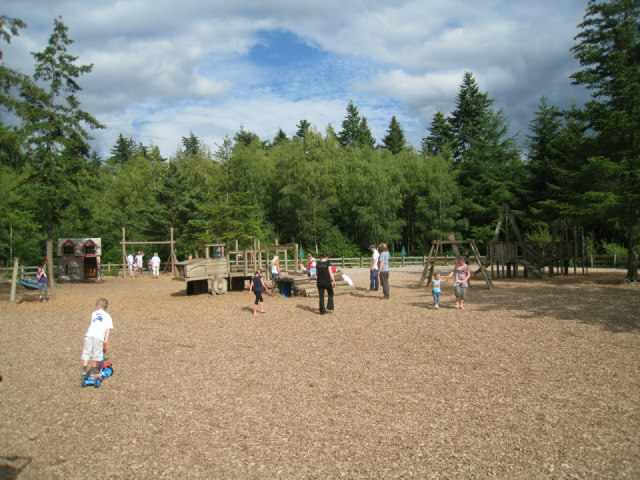 There are always activities on for the kids at Alice Holt (they recently had a Gruffalo Trail and then a Stick Man one), there are spots for den building and there is also a wonderful play ground, as well as plenty of open space to charge about on and get rid of some energy. Should you wish to, there is a ‘Go Ape’ here too but you will need to book this in advance and, of course, this costs extra. A super place to take the bikes as well. There are facilities here consisting of a coffee shop. 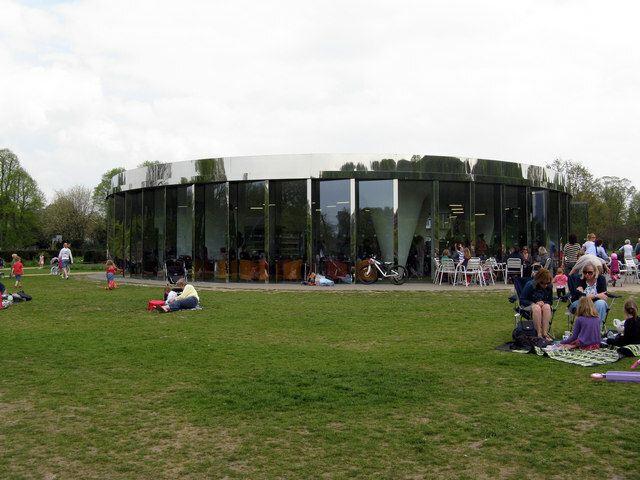 toilets, visitors centre, cafe and bike hire. Again, back in the Surrey Hills, but it is so beautiful there it’s hard not to love it. Leith Hill, the second highest point in South-east England, is my favourite place to go with the family. The views are second to none, on a clear day you can see the city of London sprawling out in front of you and it’s a view I think you’d never get bored of seeing. There is a tower, built in 1765, there which you can go in and climb to the top (WARNING: not for those who aren’t able bodied, scared of heights or claustrophobic!) and the view from up there is simply breathtaking. There is a small fee to go up the tower to help maintain it. Take a picnic, go for a walk, sit and admire the view, get lost in the woods, take in a sunset, visit in the depths of winter. Whenever you visit, you won’t be disappointed. There are various car parks available nearby. Good for: Escaping it all whatever the weather. Price: Parking, free along the roadside or no more than £3.50 in the car park. National Trust members park for free. Leith Hill Tower is £2 for Adults and £1 for children. Do you have a favourite free or thrifty place to visit in Surrey? If so, do get in touch with me on knuttalls@gmail.com and I will include it in my next ideas post! Great post, very useful, even for a grown ups day out. We are in south Hampshire some are just a bit far for us, but I’ll definitely be taking grandchildren to some of these. GeorgieMoon recently posted…What Olympic event would you take part in? Fear not Georgie, I’m going to endeavor to work my way around our bordering counties too, Berkshire, Hampsire to follow… We are always spending days out in both these counties. Check out a Elm nursery in Sutton green, it’s a family run garden centre with little farm attached, and a cafe serving the all important ‘home made cakes’! (Cafe closed on Mondays) You can buy animal food from the farm shop and entry to the farm is £1 per person and free to under 2’s. It’s my favourite find of the summer, my little boy loves it there and a cheap afternoon/morning visit. Sophie that’s an amazing suggestion! I love right near there really (10 mins away) and I’ve never heard of it! We used to go to Guildford and Box Hill – makes me miss Surrey a little!